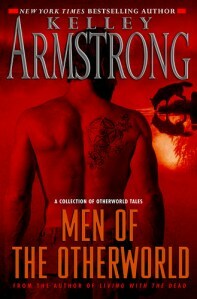 Men of the Otherworld is one of the two collections of short stories that Kelley Armstrong wrote as gifts to her fans. And they are, indeed, exciting for those of us who have followed the series and fallen in love with her characters. All but one of these stories are prequels, set before the main novels. But I wouldn’t necessarily tell someone new to the series to read them first. The stories come first chronologically, but I think you’d have a better appreciation for them at least after Stolen. (And the last story in the mix takes place after No Humans Involved.) You don’t have to read these stories to keep up with the series, but they are fantastic and fans really won’t want to miss them. “Infusion” – narrator: Malcolm – This is the story of Jeremy’s conception. We’ve known from the beginning that he is different and special. This gives us a little insight into why. We meet his Japanese mother and learn that she approached Malcolm on purpose, to infuse his werewolf blood into her own supernatural bloodline. This is also our first look at Malcolm and we get an idea of what a jerk he is… although the true breadth of that isn’t seen until later stories. “Savage” – narrator: Clay – This is the meatiest story in the bunch. Here Clay tells us the story of how he became a werewolf and how Jeremy took him into the Pack. We see firsthand the events that turn Clay into the man we know… why he cares so little for human conventions, why he is so loyal to Jeremy, and even how he became friends with Nick. We get the oft-mentioned “guinea pig” story and see the events that turned Clay and Daniel into enemies… a pivotal development that lays the foundation for Bitten. The story also gives insight into Jeremy and his early relationships with both his father and the other members of the Pack. It’s definitely a switch from the reverence the other wolves hold for him now. This is a great story and it’s worth getting the book, even for this novella alone. “Ascension” – narrator: Clay – This story feels almost like an extension of the one before. It picks up with Clay at 11 years old and shows, through his perspective, Jeremy’s rise to pack Alpha. It’s a process that spans more than a decade. In that time, we see how Clay becomes the Pack enforcer; how he gained the reputation as a psychotic killer; even what’s in those pictures of his dirty-work that we’ve heard reference to. The story shows how the Pack has come to be in its current form and why its numbers have dwindled… and most importantly, how Malcolm was finally defeated. Really good stuff. “Kitsunegari” – narrator: Jeremy – In “Infusion,” we learned that Jeremy came from a line of supernatural women, but it’s in this story, we finally find out what they were. Jeremy is with Jamie, attending one of her shows, when he is lured away by an Asian woman. She tries to seduce him, but with no luck. Jeremy is able to eventually determine that she is one of an ancient race of fox-shifter deities and they want Jeremy to help them repopulate, since he is descended from the worshippers infused with their powers. This was probably the least thrilling of the four stories, though I did like the little bit of backstory Jeremy gives about how and when he started falling for Jamie. I really enjoyed this collection of short stories… and wouldn’t hesitate to recommend the collection to any Otherworld fan. 5 stars. I have had this author in my TBR pile for way too long. I must start reading her novels. They seem right up my alley. Congrats on your Nook! I have the Nook Color and it was love at first sight..lol. I hope you love it as much as I do!! click here to enter my Book-A-Day Giveaway all month long!